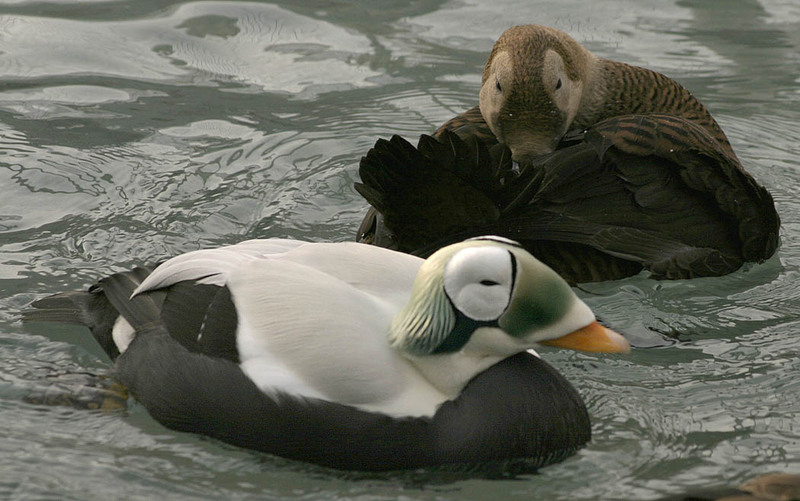 The Spectacled Eider (Somateria fischeri) is a large sea duck, which breeds on the coasts of Alaska and northeastern Siberia. The lined nest is built on tundra close to the sea, and 5–9 eggs are laid. This species dives for crustaceans and molluscs. The winter range is poorly known, but satellite tracking has led to observations of large flocks of the birds about 100 km southwest of St. Lawrence Island in the Bering Sea during March-April. This area has large populations of bivalves in the underlying sediments at depths of about 60 m that the ducks dive to feed on.